TOKYO -- Reversing his profit forecast to a loss, Nissan Motor Co. CEO Carlos Ghosn entered crisis mode today. Ghosn announced plans to slash 20,000 jobs, cut production by 20 percent, scale back new model launches and delay new factories. Nissan could also seek government bailout loans, Ghosn said. The 265 billion yen ($2.91 billion) net loss Ghosn now predicts for the fiscal year ending March 31 would be his first loss since taking the charge of Nissan in 1999. The outlook wipes out an earlier forecast for net income of $1.76 billion. Ghosn has put on hold the Nissan GT 2012 mid-term business plan announced last year and its target of achieving 5 percent revenue growth through 2012. That plan was introduced after the earlier Value-Up initiative missed its unit sales goal. The top priority now is preserving cash as Nissan and Japanese rivals struggle against collapsing global demand, a surging yen and shrinking access to credit. Of Japan's six big automakers, only Honda Motor Co. and Suzuki Motor Corp. are still predicting profits. "Nissan is operating in an environment in which we are hit with three challenges at one time, the credit crisis, economic recession and strengthening yen," Ghosn said here Feb. 9, while announcing fiscal third-quarter results. "Systematically, the worst scenario happened."  Slashing global workforce to 215,000 from 235,000 by end of 2009.  Cutting labor costs by 20 percent to $7.69 billion.  Limiting launches to 48 new products in next five years, instead of 60 as planned.  Slowing the ramp-up of Nissan's new factory in Chennai, India. 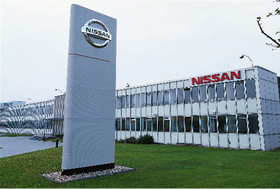  Suspending Nissan's involvement in a new Renault factory in Tangiers, Morocco.  Reducing board member pay by 10 percent, managerial pay by 5 percent. Nissan will also approach governments worldwide about possible credit lines, Ghosn said. He applauded industry support measures already implemented in Europe and being considered in Japan and the United States. "We need access to financing, that's all we're asking," he said. "Cash is king," Ghosn said. "You need to generate cash and be extremely rigorous with cash." The company may seek up to $549.5 million in low interest loans from the Japan's government-backed Development Bank of Japan, the Nikkei newspaper reported. It may also try tapping the $25 billion the U.S. government has earmarked to help automakers and suppliers retool factories to make more fuel-efficient vehicles. For the full-year, Nissan expects an operating loss of $1.98 billion. That's against an earlier outlook for operating profit of $2.97 billion. The company will rein in capital expenditure by 21 percent in the current fiscal year and then cut again by 14 percent next year. The cuts will help Nissan save cash, Ghosn said. That will bring Nissan's spending on capital investment to $3.63 billion in the next fiscal year, from $5.37 billion in 2007. Ghosn warned that global volume will shrink as low as 50 million units in 2009, from an estimated 62 million last year. To match it, Nissan is aiming to cut production by 787,000 units by the end of March - a 20 percent decrease from its planned volume. The 20,000 job cuts account for roughly 8.5 percent of the company's workforce. They include some 2,000 temporary jobs that have already been cut in Japan and another 1,200 early retirement buyouts from the United States. Nissan has also already announced 1,680 cuts in Spain. Nissan did not give details about where the additional cuts will hit.